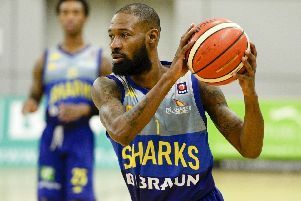 Sheffield Sharks captain Mike Tuck feels Atiba Lyons’ side have turned a corner following a gruelling week in which they reached the British Basketball League Trophy final. Sharks, on the back of a testing schedule of late which saw them play five games in 10 days, made their first silverware final since 2016 with a 161-152 aggregate success over Worcester Wolves – and will face either London Lions or Leicester Riders at Glasgow’s Emirates Arena next month. But Tuck insists the Sharks’ efforts will be focused solely on their next three league games, all of which are on the road, before they even think about that final. “We’ve got three away games, we’re not looking ahead of ourselves at all,” said Tuck. “We’re taking it a game at a time. We want to win these next three games so that we can build some momentum going into that final. Tuck wasn’t completely satisfied with the Sharks’ record during their hectic period – which included a loss at a Plymouth Raiders side which was previously without a BBL Championship win since November. However Tuck, in his sixth year as Sharks captain, insisted the week finished in the best possible way with the biggest win of Sheffield’s season so far. “It wasn’t the greatest week for us in terms of losing at Plymouth and losing to Leicester – but we did make a final out of that. “It was a tough week for us with five games in nine or 10 days. Tuck felt deflated after an agonising defeat to Leicester last Friday – but praised the Sharks’ ability to pick themselves up and dig out a big win just two days later.